Some areas in which MicroOptions is working for poverty alleviation include social mobilization, livelihood development, microfinance and social sector services development. IBP has introduced a Diploma in Microfinance in collaboration with the Pakistan Microfinance Network (PMN). The microfinance industry has gained significant momentum and has articulated a need for trained human resource. Given the challenging nature of the industry, the need for a comprehensive yet a cost effective program has become evident. The second exam for Diploma will be held in Oct, 2014. Registration date will be announced later. 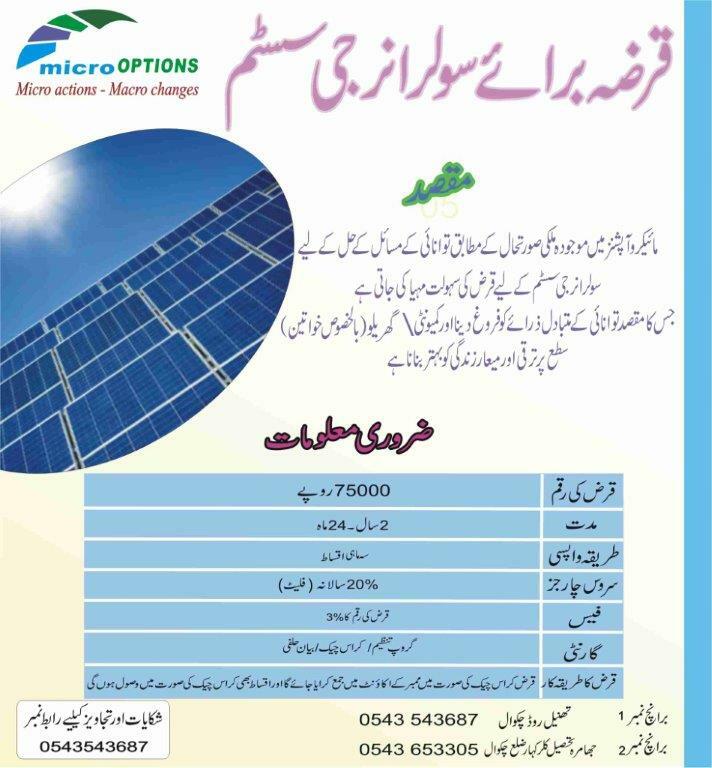 For registration and other information about the Microfinance diploma, please click on the link: http://www.ibp.org.pk/imfd.aspx . PMN and IBP appreciate your efforts in the capacity building of the professionals of your institution and look forward to receiving nominations for the program. Currently one of the challenges faced by the microfinance sector is strengthening of governance structures. It has been identified as one of the biggest risks faced by the sector stakeholders such as donors, regulators and policymakers and analysts whereas corporate governance was not viewed as a big threat by practitioners collectively. This goes to show there is a significant gap between perceptions about good governance standards amongst practitioners and other stakeholders. In addition, as the sector has grown and diversified a number of different types of players have entered the market. The industry’s eco system has become complex and now encompasses players beyond traditional services providers, such as telecom companies, insurance companies and commercial banks. The landscape in terms of funding for the sector is also changing and the ability of institutions to access commercial funds is increasingly gaining importance. Weak governance remains a constraint in this context, especially for the non-regulated microfinance institutions. Microfinance, unlike mainstream financial services, also carries a high reputation risk as shown by crises in India and around the world due to the profile of its target market. Having strong governance structures which enforce transparency and mission alignment is important to mitigate such risks. Keeping this in view, State Bank of Pakistan awarded PMN with a project titled “GOVERNANCE NEEDS OF THE MICROFINANCE INDUSTRY: A Customized Training Program” under the Institutional Strengthening Fund of the Financial Inclusion Program (FIP). This project was managed by the Pakistan Microfinance Network (PMN) and implemented by a Consultant, in this case Hikmah Consulting with an aim to achieve the targets and deliverables set out in the SBP has developed the course with the support from PMN, which has been endorsed by PPAF. Address the governance needs of the microfinance sector and also help MFPs build their capacity for growth and to overcome the challenges ahead. Enhance the governance awareness and skill levels of Directors and senior management of Microfinance Institutions (MFIs) and Microfinance Banks (MFBs). Increase ability of MFIs and MFBs to attract Directors with the relevant skills. Promote higher levels of governance within MFPs so as to make the goal of promoting financial inclusion more achievable. The first offering of the MFCG training was held in Karachi on Jan 28th and Jan 29th, 2014 and was inaugurated by Mr. Saeed Ahmad, Deputy Governor of the State Bank of Pakistan who was accompanied by Dr. Saeed Ahmad, Director and Head of the Microfinance Department and the second offering was held in Lahore on March 24th and 25th, 2014. This 2-day course is designed to provide insight into the concept of corporate governance, the regulatory framework in Pakistan, the corporate structure for organizations, controls, audit, compliance and risk governance. This course also highlights issues of consumer protection. The faculty arranged by Hikmah reflected experience with and exposure to the microfinance industry as well as the financial sector overall. It included Mr. Zubyr Soomro, Dr. Ishrat Husain, Mr. Salim Raza, Mr. Saulat Agha, Mr. Aziz Rajkotwalla and Ms. Amena Arif from the IFC. Kashf Foundation developed a new product that provides a business solution to improving the level of education low-income households are accessing. Over the past two decades there has been phenomenal growth in the private education sector in Pakistan – this growth is not just limited to expensive schools catering to the rich but also includes low-cost schools catering to the poor. A large number of low-income households prefer to send their children to these private schools as the quality of education is much better than their government counterparts. Kashf’s School Finance Facility aims to help low-cost private schools improve the quality of the education through capital support, teacher training and curriculum development support. Kashf works closely with the school management to assess the needs of the school and also audits the quality of teaching and curriculum. After a detailed assessment, the school owners and Kashf staff undertake a consultative process to determine the most important capital needs for the school, which may include infrastructure, investments in working capital and other improvements. Kashf also provides capacity building support which includes training/development of the owner/entrepreneur, teacher trainings for the school staff, and curriculum development/improvement support. Currently, Kashf is piloting this programme and plans to roll it out in the next 12-18 months. One of the beneficiaries of this programme is Ms. Nargis Ahmad who runs a small school in the locality of Walton in Lahore. Nargis suffers from polio but despite that she is committed to running a low-cost private school to help children in her community gain access to high quality education. She says, “I wish to make my school one of best schools in the city.” In 2002, she started a small coaching centre and after a year she decided to open her school which currently has an enrolment of 120 students. The school is co-educational up to grade 5 and exclusively for girls from grade 6 to grade 10. In terms of challenges, Nargis faced problems of space and furniture. When Nargis met the Kashf team and came to know about loan provision for school development. She requested Kashf Foundation for Rs. 100,000 for furniture and classroom items. Along with this all teachers from her school, all of whom are female, will also be attending the teacher training sessions being undertaken. She is very pleased with the services she can now access and says, "I will give my best efforts for this school and its children as well. I will do my best to make a bright future of our children." ASA Pakistan is one of Pakistan’s leading MFIs with operations in 44 districts of Sindh and Punjab with a portfolio of around PKR 2 billion and total active borrowers of 166,000 by June 30th, 2013. ASA has launched a website for its Pakistan operations at www.asapakistan.com. The site gives a holistic view of ASA Pakistan operations, methodology and information about its governance and management structures. ASA Pakistan has adopted comprehensive guidelines against bribery and misconduct effective from July 1st, 2013, as the organization attaches high importance to eradication of malpractices and has a zero tolerance policy towards bribery and misconduct of its staff. These guidelines will help ASA Pakistan to take immediate, appropriate and effective action against staff involved in negative practices. To support the policy, ASA Pakistan has started orientation sessions at the area office level to acquaint its staff with the ethical values of ASA. It is hoped that the adoption of these guidelines would also promote client protection. 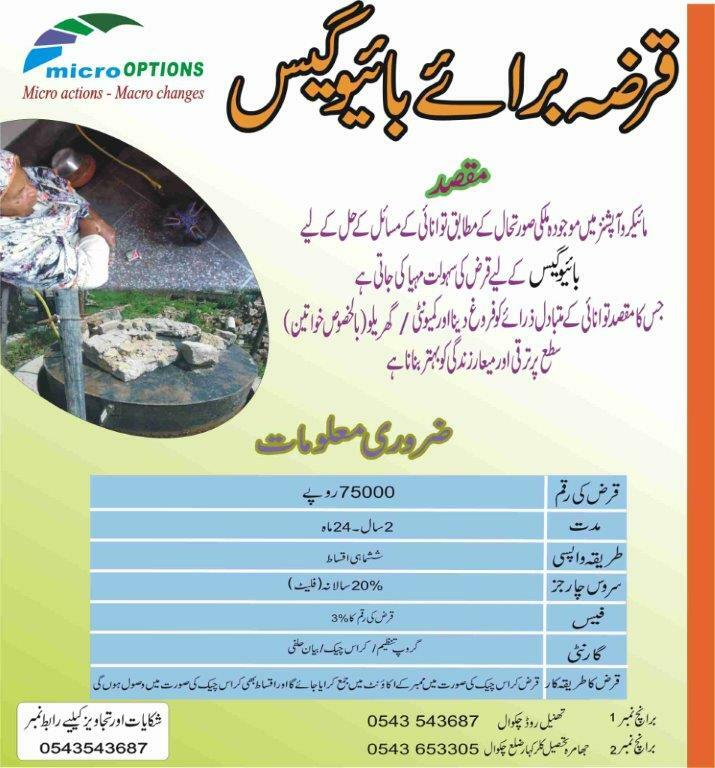 NRSP Microfinance section is currently implementing a pilot project of crop and livestock micro insurance designed by PPAF in partnership with the Security and Exchange Commission (SECP) of Pakistan. The purpose of this initiative is to implement action research of a sustainable market based crop and livestock insurance model which best suits the economic needs and social characteristics of the country with particular focus on small and marginal income farmers. The pilot product covers two types of insurance: Weather Index-Based Crop Insurance, and Livestock Insurance in Talagang, Chakwal. The weather index-based crop insurance and live weight products are the first of their kind in Pakistan and two local insurance companies – Alfalah and United Insurance have been engaged to provide insurance cover. Under the Weather Index Crop Insurance product the insurance company provides compensation to the insured when the rainfall recorded by the weather stations of the insured land is below a minimum threshold. The claim payment is based on the value of the index and results received from the weather stations installed at the four different locations in project area. In case of the Live Weight Livestock Insurance product the sum insured of the policy is linked with the actual weight of the animal at the time of insurance. 14 mobile weighing machines have been made available in different locations to record the weight of animals which are helpful in minimizing the administrative cost. The premium of livestock is different according to the type and insurance covers mortality due to accident, natural perils, poisoning and diseases. Compensation is linked to the actual weight of the animal at the time of insurance. This methodology is helpful in assessing the cost of animal at time of loss as it reduces moral hazards and ensures provision of sufficient compensation to the policyholders. PPAF understands the diverse needs of microfinance clients and remains committed to innovate and protect the clients. To this end, new financial products, services and delivery mechanisms that make a difference in the lives of the marginalized are being deployed. PPAF as the sector developer, market leader and apex institution is focused on creating synergies, partnerships, linkages, and champions the call for provision of inclusive and holistic financial services to the population by retaining a focus on neglected and underprivileged communities. Priming the sector for microfinance plus, PPAF has initiated numerous client centric initiatives in the sector. In order to protect clients and mitigate risk of loss inherently found in investments for crop and livestock, PPAF designed and implemented index-based crop and livestock insurance products with particular focus on small and marginal income farmers. PPAF piloted two products Weather-Indexed Crop Insurance and Live-Weight Livestock Insurance in Soon Valley and Talagang and these products have now been scaled up to communities in Layyah, Muzzafargarh, Tharparkar and Matiari. Aimed at institutional development, business development services, technical assistance, creation of backward and forward linkages, increased gains for clients and communities, PPAF initiated the embroidery value chain for women clients working on ‘justi’ embroidery in Haripur, a poultry value chain for communities in Swabi and a dairy value chain in Sheikhupura. With the evolution of microfinance and increased focus on needs of clients, there is now a greater necessity for technological interventions such as branchless banking and savings to bring about efficiency, flexibility and increased outreach across Pakistan. PPAF seeks to design and implement a full scale branchless banking and savings model through partner organizations while leveraging the branchless banking platform with the aim to provide the un-banked clients with affordable and efficient access to banking services along with savings and convenient channel for their domestic and international remittances.